This chart uses data from the US Energy Information Administration to compare federal investments in green energy and the share of green energy in electricity generation. Wind energy receives the lion’s share of renewable-energy grants. The industry has received nearly $30 billion in federal subsidies and cash grants over the past 35 years, and Washington has promised another $12 billion in subsidies in the next decade. 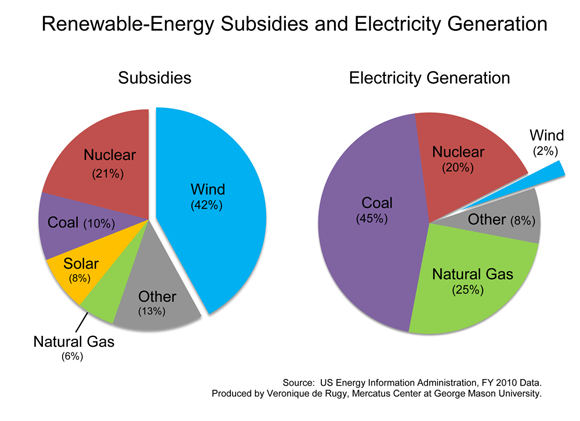 Among the specific fuels and technologies, wind plants received the largest share of direct federal subsidies and support in fiscal year 2010, accounting for 42 percent of total electricity-related subsidies. From 2000 to 2010, federal wind subsidies grew by an average of 32 percent per year while subsidies for other energy sources remained relatively flat. Between fiscal years 2007 and 2010, annual wind subsidies grew from $476 million to nearly $5 billion almost tenfold. While the data of the full amount of subsidies is not available, as of March 21, 2013 DOE’s 1603 program funded $18.2 billion in cash grants for renewable energy projects. Furthermore, according to the National Renewable Energy Laboratory, the wind industry has received $8.4 billion in subsidies through May 2012. Wind energy is subsidized through dozens of different federal credits, grants, and loan guarantees. These programs give wind producers significant pricing advantages over other, more reliable sources of energy. Despite this advantage and the extraordinary federal investments in wind energy, wind energy produced only four percent of the entire US electricity generation in 2012, coming in a distant fifth place behind coal, nuclear, natural gas, and hydropower. Taxpayers should not be forced to shell out billions of dollars on subsidies for such a low-value energy generator that has already been heavily subsidized for 35 years. Data note: electricity generation data from the EIA were updated in May 2013; subsidy data were not. Therefore, we use the 2010 figures in order to compare total subsidies, support received, and share in total generation. Solar provided 0.02 percent of total electricity generation in 2010.